Kuwait: Turkish Airlines, Europe’s best airline for six consecutive years according to the recent Skytrax Passenger Survey, recently presented the 4th edition of Turkish Airlines World Golf Cup, the famous amateur golf tournament around the world. The global amateur golf competition saw participants which consisted of winners of qualifying events in 100 destinations worldwide. The introductory event of this tournament’ Istanbul phase was organized in the Galatasaray Islet -also known as Suada, a small island situated just north of the Bosphorus Bridge, which is the iconic symbol of Istanbul, and natural crossroad of different cultures. During the opening event, amateur golfers from all around the world were invited to hit a golf ball from one continent into another aiming at a hole placed on the water. One of the participants was able to score a 70 metre and received the chance to win two Turkish Airlines business class tickets for his destination of choice around the world. For all the participants TAWGC 2016 was a fantastic opportunity to discover the beautiful city of Istanbul where Turkish Airlines has its luxury lounge located in the International Ataturk Airport and where passengers were able to experience the traditional Turkish hospitality, largely due to the exclusive facilities and excellent services. 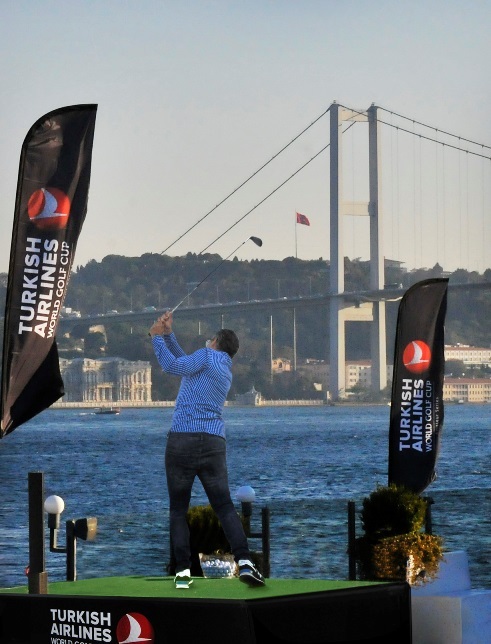 The winner of the Istanbul tournament held on 30 September – 2 October at Kemer Golf Country Club- will get an opportunity to attend the Turkish Airlines World Golf Final in Antalya on 31 October-1 November where fourteen time major champion Tiger Woods is scheduled to appear together with the top 70 players in the Race to Dubai standings, to fight for a prize of USD 7 million. The Grand Final will be hosted by the luxury Titanic Deluxe Belek at the end of October 2016, with a two round tournament taking place at the newly renovated Titanic Golf Club, a rewarding Hawtree-designed course that offers stunning views of the glistening Mediterranean. With 291 destinations worldwide, Turkish Airlines is always committed to delivering its passengers with experiences that always exceed expectations, in the sports events as well as in its every day flights.